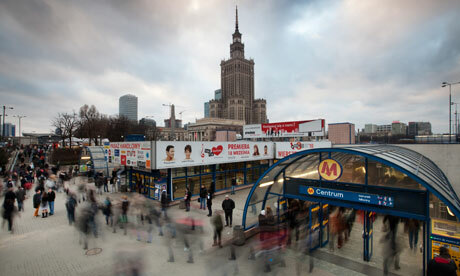 The Guardian’s series New Europe comes to its last week by sketching a profile of Poland. Is Poland really struggling to find its true place in Europe? “It still feels apart from the west“, contends Timothy Garton Ash, explaining how the country tries to come into terms with “being normal”: Being in Warsaw these days is like being in Madrid or Rome. It’s normal. Except that for Poland, this normal is profoundly abnormal; the ordinary, extraordinary. Read about Poland’s ex Solidarity trade union leader, and his pessimism on the country’s state of affairs, and his biopic by Oscar-winning Polish film maker, Andzrej Wajda. Listen to a podcast on the future of Polish football and its preparation for the 2012 European Championships, learn how Warsaw is turning into a techno paradise for young Poles and take a glimpse into the stereotype of Poles being homophobic. Enjoy the last week of this series and let us know what you think. I understand that articles must have a word limit, but I think that Garton-Ash makes totally fleeting remarks about the Polish political class without fully explaining what he means (and in the process sounds very one sided). This really got me going, especially when reading comments of the Guardian website which state “nice and well-balanced article”. Christ that makes my blood boil. The article is also extremely cheesy, what with his hobnobbing with Komorowski. And I wouldn’t call Donald Tusk calm and pragmatic either: or rather with the former I would. He been so comatose that he’s running the country into the ground financially, so talk of this green island is actually a load of boll***s. As for the other article I read on the Polish family in Nowa Huta, it was a little better, but it’s *so* Guardian just to label Radio Maryja as if it were sponsored by the entire Church in Poland, which it simply isn’t. In fact, there are a great deal of Catholics in Poland which can’t stand the moralising bullcrap (also often anti-Semmitic)pumped out by the antennas and satellites of Father Rydzyk.